My company, Electric Impulse Communications, Inc., was named after a horse! The first Electric Impulse+ was a big, white Arabian Stallion. Impi, his barn name, was an ugly grey duckling that grew into a magnificent white swan. 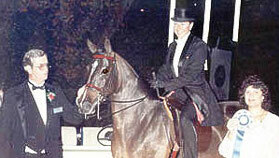 He was bought on an “impulse” and would eventually be named one of the Top Ten in his horse show division in the United States and Canada, and third in the World. Impi taught me lessons that inspired Electric Impulse, Inc. and lessons that I try to teach others through keynotes, presentation skills training, and one-on-one coaching. Impi was more than his show record. As all of us are more than our resume. Impi was even more than his record of wins. Impi embodied the spirit of a true professional, he understood the importance of being on when the spotlight of life is on you, he excelled beyond his capabilities, he never gave up, he knew how to make an entrance, he understood the importance of practicing the basics, he believed he could compete with and beat unbeatable competition, he was willing to listen and work to be the best he could be, and he knew to shine when his picture was taken. We are not as fragile as we think. Perseverance beats potential most of the time. Timing can be everything. Sometimes you only have to be at your best for 15 seconds. The value of mental and physical time off. and at the end of a shovel!